Keiko, the killer whale that starred in the film Free Willy, has died in Norway at the age of 27, 18 months after he was returned to the wild. The six-ton whale apparently suffered a sudden bout of pneumonia in the fjord where he had been living. Keiko was captured when two, but after the success of the film, he was freed from cramped conditions in Mexico City. After his release into the wild in Iceland, Keiko swam to Norway, where he became a popular attraction. Killer whales live an average of 35 years in the wild. Keiko became ill very quickly, according to Dane Richards who looked after the mammal. "He exhibited some signs of lethargy and lack of appetite," Mr Richards told the Associated Press. "We checked his respiration rate and it was a little irregular ... he wasn't doing too well. Early in the evening, he passed away," said Mr Richards. "They really do die quickly and there was nothing we could do," said Nick Braden, a spokesman of the Humane Society of the United States. Keiko, whose name means "Lucky One" in Japanese, starred in three Free Willy films, in which a young boy befriends a killer whale and encourages him to jump over an aquarium wall to ocean freedom. 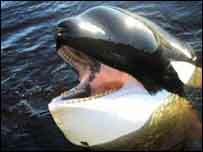 Captured near Iceland in 1979, Keiko ended up in a marine park in Mexico. Inspired by the films, an international campaign began in 1993 to free Keiko and return him to the wild - the first orca whale to be freed in this way. "We took him from near death in Mexico to swimming with wild whales in Norway," said David Phillips, executive director of the Free Willy-Keiko Foundation. After being trained to catch fish, Keiko was released off Iceland in July 2002, and swam to Norway, where he became so popular that he was moved to a more remote fjord for his own comfort. Mr Phillips said it had still not been decided whether he should be buried on land or at sea. "My preference would be to bury him on land," he said. "If you bury him on land we could still recover his skeleton and that might have some value in a museum or something, but that is still being worked out." "The film became an international success"